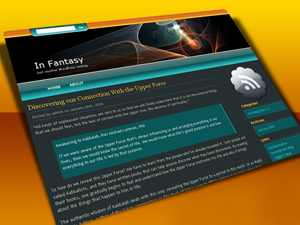 InFantasy wordpress theme is a beautiful dark futuristic wordpress design. The theme has 2 columns and is Web 2.0 compliant. The header graphich is orange on top, the search function is embeded into it. Below the orange stripe there is a futuristic, artistic 3d graphic and the blog’s title. Just below that, there is a green stripe with links to your blog pages. The main background is black and the main content area is dark greeny-gray. The sidebar is located on the right side and supports wordpress widgets (remember to enable widgets in your blog’s admin area under Appearance tab). InFantasy wordpress template was designed by Lorelei. A beautiful looking blue and black colored theme! The sound of the future is a unique looking theme with futuristic design of microchips in the header that has a variant color scheme of red, pink, blue and black. The theme has been designed by the webhostingrally.com. The header of the theme is large and distinct and thus catches the main attraction of the visitors. It is a fixed width two columned theme with an entirely blue colored background. The content area displays the recently posted posts and comments for the website while the distinctly separated sidebar that allows you to remain linked with the other categories and posts of the website. 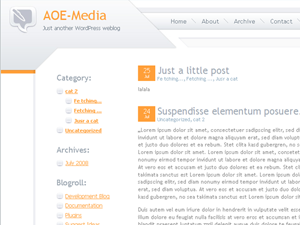 A futuristic, technology based wordpress theme with the perfect header designed by 5shadestemplates.com. The theme has an attractive looking grey based header with graphic designs of green and red colors. The header also has a distinct search area for searching the related materials from the web and a red box for the site name. The backdrop of the theme is entirely grey colored. It is a fixed width two columned theme which has a content area for the posts and the comments. The theme has a distinct looking dark grey colored on the sidebar with white colored sidebar titles. The sidebar comprises of the various links that help you to remain connected with the various categories and related topics.